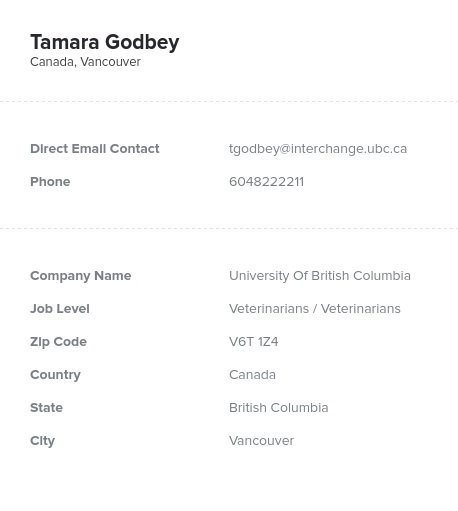 Connect with Canadian veterinarians easily with the help of this consolidated, accurate directory. Find vets’ emails, phone numbers, postal addresses, names, and other important contact information and start networking with these animal-loving medical professionals from across Canada today! Marketing your pet-friendly products is easier than ever with the help of this veterinarian email list. It doesn't matter if you're marketing a product line of dog bones, horse blankets, pet pharmaceuticals, or cages: One of the best ways to get your products seen is by marketing to the medical specialists who will recommend them. You can do that by pulling this consolidated vet lead list, which includes the information of numerous veterinarians' offices and clinics throughout Canada into one reliable resource. This pre-built directory of vets in Canada is ready to download now. Because it comes as a .xlsx or .csv data file, it can be easily downloaded, integrated into a CRM, and used within just minutes. Boost sales and make sure your pet product is recommended by the biggest influencers on pet owners: veterinarians! Start emailing, calling, or writing to this elite group of specialized, independent professionals after just a few clicks. After downloading this veterinarian email list, you'll be able to target a normally spread-out group of contacts. Market your dog, cat, horse, or other pet product more efficiently by targeting the people who are likely to use or recommend your brand with this affordable lead list today!